1. Thou Shall Not Chase Anything or Anyone. A DIVA stands still in her fabulousness and attracts what she wants. 10. Thou Shall Ask for What You Want and Then Set Up The Conditions Needed in Your Life to Allow it To Happen. RSVP for Los Angeles DIVA Dinner on Thursday September 24th. 1. Focus on Helping, Instead of Selling You shouldn’t be trying to force people into purchasing your product or service. You should find people who want your product or service and then focus on offering any helpful information to them so that they can make an informed decision. 2. Target If you’re trying to target everybody, then chances are, you’re not targeting anybody. For example, if you’re selling something that homeowners would want, as opposed to renters, then target homeowners. State your target clearly in all of your marketing materials. Recently, I was having a conversation with some random girl and when I mentioned that I was into nutrition, she asked me to give her my five rules of nutrition, the five things she needed to know to eat right. I managed to come up with three off the top of my head and told her that basically covered it, then later realized that one rule is all that’s needed. You must follow this one simple rule to put yourself on the road to top-notch health. Now, I’m not a genius that just broke the code of the universe. Jack Lalanne said, “If man made it, don’t eat it.” Michael Pollan broke it down to “Eat food. Mostly plants. Not too much.” It really is that simple. So many nutritionists want to make it difficult; confusion keeps them employed. Look at the Food Pyramid, which was at least an attempt to get people eating right. Too many rules, too many gray areas. We can argue that the Food Pyramid is a convoluted mess of ill health, but the pertinent fact is that it’s too difficult to figure out, even if it was any good. What exactly is a serving? And how do I decide if I need 6 or 11 servings of grains? Is that pork chop “lean”? And then there are all of the rules about saturated fat, cholesterol, calories, total fat, sodium, and sugar intake. How can you make heads or tails of anything this complex? We can argue about low carb, low fat, The Zone, Ornish, Atkins, and Weight Watchers until we’re blue in the face. But civilizations have thrived on diets of varying macronutrient proportions throughout history. The Inuit ate a diet of almost no carbs and mostly fat with no ill effects. The Masai drank cow blood and milk and ate meat like it was going out of style. As the nutritionists gasp, I’ll mention that the Masai achieved prime health too. The diet on the island of Okinawa is heavily weighted towards vegetables and rice with some fish and little meat, high in carbs, low in fat. Again, very good health; Okinawans have excellent longevity. So it’s not so much about the macronutrients, as long as you’re getting enough protein and fat to allow the body to function properly. It’s about the types of food being consumed. Dr. Weston Price noted that traditional civilizations thrived until they were introduced to processed grains and sugars, at which point, health declined markedly. We all know someone that follows a low-fat diet or low-carb diet by eating every processed product in the store that excludes their chosen macronutrient (”Angel Food Cake is a fat-free food!”). They rarely make the progress they’d like to. Why? Because before you can worry about macronutrients, you need to focus on food. You don’t eat nutrients. You eat food. Food grows and dies. It isn’t created. Food rots, wilts, and becomes generally unappetizing, typically rather quickly. Food doesn’t need an ingredient label (and probably isn’t in a package either). Food doesn’t have celebrity endorsements. Food doesn’t make health claims. Oreo cookies – Hold while I read the ingredients. Are you serious? Sure, there are still a few gray areas. That’s the life of an omnivore. For instance, what about oatmeal and other whole grains? Those are things you will have to decide for yourself. My guidance is to keep grains to a minimum, if included at all. Cheddar cheese from raw milk? Probably okay. Velveeta? Not so much. Lard? For sure. Olive oil? I say yes, though it could be argued both ways. Crisco and margarine? Not a chance. What you notice is that few of these foods, with the exception of cooking oils, come from a factory. They just exist. There’s no secret formula to create them. Even olive, coconut, and palm oils, while requiring extraction, require no special knowledge. Just press really hard and you get oil. Nobody has a patent on the flavor of an apple. The ingredients in zucchini can’t be tweaked to ride the current nutrition wave. Eating real foods virtually eliminates one of the hardest parts of maintaining your weight: counting calories (or carbs or fat). Real foods have a built-in feedback mechanism to keep you from overeating. Protein and fat stimulate appetite-suppressing hormones. 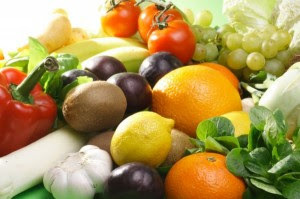 Fruits and vegetables tend to be bulky for their caloric content. Some may want to argue about Glycemic Indexes and other fun things, but no one gets fat by eating carrots. People get fat by eating fake foods. Just eat real ones and I guarantee that you’ll shed fat and feel better. That’s not to say that there’s no place for managing your carb, fat, and protein intake. But before embarking on any road that gives you a set number of carbs or fat to eat, you must decide to eat real food. Until you start with real food, you will struggle. Once you start down the path, you may need to tweak if you’re going to try to build muscle or compete in marathons, but for health, just eat real food! Your body, which is significantly smarter than your mind, knows what it needs and if you feed it real food and then pay attention, it will give you feedback. Here are 10 things you can Tweet about- drag this list out when your mind runs blank. The best way to develop relationships with people is to respond to their posts and conversations. Key in the @ sign followed by the person’s username (no spaces) with your response. Give support, laugh, share a similar experience… do what you can to show others that you’re interested in what they are Tweeting about. Second to @Replies are Retweets. When you see shareworthy posts, key in the letters RT or the word Retweet then @TheirUserName. If you use applications like TweetDeck or Twhirl, it makes this very easy. Retweeting is good karma 2.0! You can fill an event and build anticipation by counting down to start time. 1 day left, 1 hour left, 5 minutes left… this strategy has worked incredibly well for live video casts, podcasts, teleseminars, and even in-person Tweet Ups! If you’re a blogger, let folks read your latest post by Tweeting the title and a link. Better yet, make it really simple by using a site like Twitterfeed. Whether you’re wandering an Expo Hall, attending a webinar, at a conference, or listening to a teleseminar, you can create a live newsfeed with your Tweets. Use a site like TwitPic to upload a photo and send a Tweet simultaneously. What’s great about TwitPic is that when people leave comments on your photos, it will send those out as Tweets too. This is a favorite of mine. Simply ask a question and watch your friends and followers respond. Great for impromptu market research or quick feedback. It’s OK if your Tweets aren’t all rays of sunshine and optimism… sometimes we need to commiserate in the public stream. When you Tweet about your sore throat, computer crash, lost cat, or stressful day, you’ll be amazed at the outpouring of expert support. Tweet about getting a new client, finishing a big project, meeting a deadline, achieving a milestone, or whatever else merits a bit of festivity.This is a great way for others to learn about your achievements in a non-boastful way. Believe it or not, profitable contacts have been made on Twitter simply by sharing what you’re doing at the moment. Whether it’s drinking coffee, watching the Sopranos, standing in line, or waiting out a toddler tantrum, the mundane can turn itself into an avenue for real connections. Twitter is no great mystery, it’s simply digital small talk. Small talk opens the doors to bigger, more profitable conversations. Use these 10 Twitter techniques to break the ice and make valuable touchpoints. I’d love your favorite ways to use Twitter, drop a note below! Today I am reviewing a new book I read over the holidays. Babauta recently published his first book, The Power of Less, which seeks to help readers become more efficient — and more relaxed at the same time — by limiting themselves only to the essential. Set limitations. By setting limitations, we must chose the essential. So in everything you do, learn to set limitations. Choose the essential. By choosing the essential, we create great impact with minimal resources. Always choose the essential to maximize your time and energy. Focus is your most important tool in becoming more effective. Create new habits to make long-lasting improvements. Start small. Start new habits in small increments to ensure success. The second section of the book offers practical tips for applying these six principles in various parts of your life: goals and projects, time management, e-mail, filing, daily routine, etc. The first section of this book disappointed me. Babauta’s six principles are good, but the chapters describing them are too long and the examples vague. Babauta writes, “These days we consume information, food, and media at a breakneck pace that was unimagined two hundred years ago.” Maybe so (that’s my impression too), but I want a bit of research to back it up. This sort of book lends itself to facts and figures. There’s no research cited in The Power of Less, and that frustrated me. Have only three active projects at a time, with all others waiting “on deck”. Finish all three projects, and then move three more projects to the active list. Every evening, create a list of three Most Important Tasks for the following day. Try to complete these as soon as possible, before you get distracted. If you’re leaving e-mail in your inbox because you need to do something, move the task to an external list. Get the task out of your inbox. Limit the length of your replies. Kris has been trying to convince me of this for months. When I reply to reader e-mail, I often want to write long, personal replies. This takes time. Although I’d like to write more, I’m going to try to limit myself to 3-4 sentences. Create a simple filing system. Get rid of stacks on your desk. I’m a “stacks” kind of guy, and often feel overwhelmed by them. I bought an accordion folder, and have been working to move my stacks to this. Learn to say “no”. This is a difficult one for me. For the past two years, I’ve been a proponent of the power of yes. I’ve achieved a lot by accepting the offers that have come my way. But now I’m finding I don’t have time to say “yes” to everything. 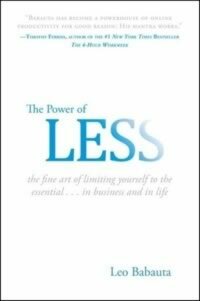 As you might expect, The Power of Less is very much like a refined and extended version of Babauta’s blog, Zen Habits. This alone may tell you whether you’ll enjoy the book. I liked it, but do have some reservations. For one, the book is tech-centric. The examples are great if you’re an office worker, but much less relevant if you have a blue-collar job or are a stay-at-home parent. Also, at times the book feels like a group of unrelated parts instead of unified whole. For example, in one chapter Babauta encourages readers to focus on only one goal at a time. But in the next (and in the rest of the book), he writes of having multiple goals. Which is it? One goal or many? Quibbles aside, I’m glad to have read The Power of Less. I’ve reached a point in my life where I’m questioning my priorities. Do I really want to spend 60 hours a week writing? How important is money relative to fitness and relationships? How can I find balance? When I read The Power of Less on Christmas Day, it had quite an impact. Over the past two weeks, I’ve used its lessons to help me re-structure how I organize my time. I’m pleased with the changes. I have embraced the power of less — and so far it seems to be working. Learn more about this book at the Power of Less website.